It used to be such a simple, innocent question: What do you want for Christmas? Tell me and it will save me the trouble of buying the wrong thing. Tell me and you'll probably get it. It's a question we've heard from our spouses, parents, children, friends -- what do you want? And just like that, you could name it. Some sparkly little thing that caught your eye. As long as it was modest and perhaps scalable (you'd be just as happy with the paperback; you'll take a dozen bulbs or a hundred), you'd probably get it. But this year it is so not okay to want stuff. In response to the "What do you want?" question, I find myself giving answers like, "I want you to hold onto your money and stay out of foreclosure" -- and I actually mean it. However. Just for the moment. Let us hearken back to those simpler times when it was okay to want stuff. Let's pretend your loved one has decided that virtue has its place, but so does buying something pretty for the person who has agreed to wake up next to you every single day, no matter how old and weird you get. Gloves. People, I know I've said it before, but it remains true: A gardener can never, ever have too many gloves. They fall apart, they get lost, they get old and crusty and miserable. So buy gloves as gifts. And the best news is that you are really free to choose any style that appeals to you -- most gardeners I know will happily use whatever they have. Heavy-duty padded gloves from West County are great for pruning roses or other rugged work; delicate stylish Foxgloves will keep the dirt off long enough to let you pull a few weeds or re-pot your containers; and the cheap but astonishingly durable Atlas gloves are true workhorses. You absolutely cannot go wrong with gloves. And if you're not sure about the size, buy them locally and include a receipt so they are easy to exchange. Plant food. It's practical, it's consumable, and it can be very, very local. More than one gardener told me that they don't want luxuries, they want basics. At one garden center, I ran into a neighbor who pointed to the gallon-sized jugs of FoxFarm's liquid organic fertilizer, Big Bloom, made right here in Arcata. The gallon jugs aren't that expensive -- maybe 30 bucks -- but it's more than she usually spends on fertilizer. If you're not a gardener, it may be hard to understand how giddy we get over bat guano and earthworm castings and liquid seaweed. But trust me, this will be the gift that says: I get you. Books. 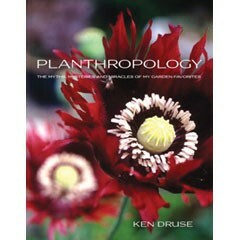 I just got a copy of Ken Druse's new book Planthropology. It's a big, gorgeous coffee table book that explores the cultural history and mythology behind familiar garden plants. His stories about how plants and people intersect will give gardeners something to talk about at cocktail parties now that the election's over. Monks once made ink from oak galls? The spiral pattern in the interior of a sunflower follows the Fibonacci sequence? Who knew? Any gardener would find this book fascinating; it's one of those one-size-fits-all gifts. And if you know a gardener who longs to undertake a construction project in the backyard, consider giving Debra Prinzing's new book Stylish Sheds and Elegant Hideaways. She visits novelist Amy Bloom's backyard writing retreat, and describes an awesome glass shed that seems to float above a shallow moat -- perfect for dangling your feet on a hot day. We can't all build an art studio/potting shed/guest cottage in the backyard, but we can dream. It's a cool book. Check it out. And of course, buy it at your local independent bookseller. Labor. I was surprised by the number of gardening friends who said that all they wanted this holiday season was a little help. Somebody with some power tools and a little muscle to help build a trellis, repair a fence or haul some rocks. There are very few garden projects that couldn't use a second pair of hands. And if you're not handy yourself, take this opportunity to hire the services of some local tradesperson and offer their time as a gift. You'll be giving somebody in town a day's work, and you'll make a gardener very, very happy. And isn't keeping us happy what it's all about?